FV-500H INDUSTRIAL-STRENGTH POWER PEDAL For 14 years, the famous BOSS FV-300 served as an indu..
FV-500L INDUSTRIAL-STRENGTH POWER PEDAL For 14 years, the famous BOSS FV-300 served as an indu..
Boss FV-50H The high-impedance FV-50H is designed to be connected before guitar effect units in t..
Boss FV-50L The low-impedance FV-50L is a stereo volume pedal that can be used for a wide variety..
DVP1XL Volume (XL) Info Create incredibly smooth volume swells or control your effect pedal param..
Volume (X) Create incredibly smooth volume swells or control your effect pedal parameters with th..
High Gain™ Volume Pedal This gold standard of volume controllers is great for pedal steel s..
Quick Specs Dual-output design Both EXP outputs have independent range and reverse. 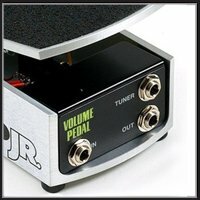 These ar..
Ernie Ball Volume Pedal 250k Junior The potentiometer has a 250k ohm resistance suitable for the ..
Ernie Ball Volume Pedal 25k Junior VP JR 25K (FOR ACTIVE SIGNALS) The Ernie Ball VP Jr 25k pro..
Ernie Ball Volume 40th Anniversary Precision built, Smooth. Solid. Satisfying. ..
Bass Press Volume/Expression/Wah-Wah Pedal The Hotone Bass Press is a 3-in-1 compact pedal des.. Soul Press Volume/Expression/Wah-Wah Pedal The Hotone Soul Press is a 3-in-1 pedal in a smart .. Vow Press Switchable Volume /Wah Pedal The Hotone Vow Press is a 3-in-1 pedal in a smart compa..
M-Audio EX-P Feel the need to express yourself fully? M-Audio’s EX-P expression controller ..